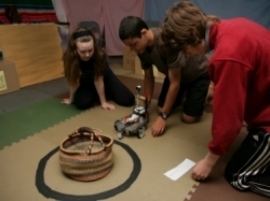 No dates has been set for the next Mayan Adventure Robotics Camps in the Summer 2014. Robotics camp where fun and science come together to create a time your child will never forget. Each day is filled with learning to build and program robots using LEGO NXT Mindstorms robotics kits. Led by experienced youth who love creating robots with LEGO Mindstorms. 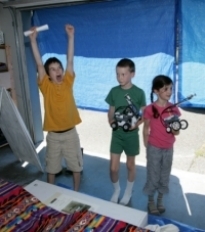 Find out what kids and their parents say about Mayan Adventure Robotics Camp. This is a great camp for kids who want to learn to build and program robots. 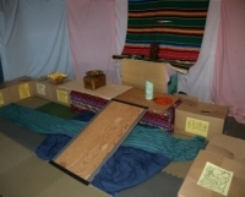 Working as part of a small team (maximum 4 per team), each day they will design, build and program a robot to explore a new room in a Mayan Temple. By the end of the week everyone will have built robots, created programs and have a folder of reference information with pictures of their robot. Please make cheques payable to Victoria Robotics Club. Fees payable at time of registration. Registration limited to keep group sizes small. Registration fees are non-refundable except for medical reasons. It may be possible to fill a spot if there is a waitlist. A $25 processing fee will charged. Programs are available for all skill levels from Beginner (no experience) to Intermediate (built and program some NXT Robots), or Advanced (lots of experience with LEGO robots and looking to learn advanced skills). Wear comfortable clothes. The kids will be outside for an hour at lunch on most days. The kids will be running around and playing games. Bring a lunch, water bottle and food for morning and afternoon snacks. Please pack lunches using reusable containers if possible. Do NOT include peanuts or tree nuts with lunches. Please complete the Mayan Adventure Robotics Camp form and send it in with payment to the address on the form. Once we receive payment, your spot will be confirmed. What do kids say about Mayan Adventure Robotics Camp? It was great. I really enjoyed each day because each day had different things to do and it was fun. The only thing I'd change is to make it longer! The camp was awesome!! You get to build and program robots. I enjoyed building robots and playing games. What do parents say about Mayan Adventure Robotics Camp? Our son loved the camp. Every day was his favorite. We've seldom seen him so enthusiastic about an activity. The camp was very well organized on several levels in a fun and motivating way. If school were as interesting all the kids would have "A"s and they would arrive early and leave late. Loved the multi-age group approach and using older students as mentors and assistants. I particularly like using older kids as mentors and role models. We thought the camp was excellent, well run and lots of fun. Mentors did a wonderful job of instilling the concept of team work and passing their skills onto the kids in the camp. I was impressed with the way the camp was facilitated by youth (but supervised by adult presence). Youth did a great job! The camp was very well organized, and well thought out. I liked the overall "ambiance". My son had fun in an educational way. This was a marvelous opportunity to be find fellow LEGO enthusiasts and in particular, to the Mindstorm program (as it is very expensive to purchase). We believe it’s important that everyone has the best time possible while at camp. The rules are to ensure the safety, protection and comfort of all campers. It’s a good idea to go over these rules with your child before he/she comes to camp, to make sure he/she knows and understands what is expected. Failure to adhere to these rules will result in consequences and resolution involving the camper, parents and Leaders. There will be no electronic equipment (walkmans, discmans, gameboys, cell phones, etc.) knives, toy guns, or lighters at camp. These items are not inclusive to everyone in our camp community and will distract from working with robots and as part of a team. If your child must bring a cell phone, it is should be turned off and remain in their backpack at all times. Parents are welcome to stay and observe the camp activities. It's fun to arrive around 3pm and watch the scoring rounds for the robot. For your child's safety she/he must not leave the property without being signed out by someone listed on the form as allowed to pick up your child. And finally, the most important rule: Have fun at camp! This page contains a single entry by Christine published on July 4, 2009 9:25 PM. Poem for FLL 2008 was the previous entry in this blog. BC Champions is the next entry in this blog.